Hello, everyone! I hope that you are doing well. I have been busy moving so I have not had as much time as usual for cooking and writing. However, now we are settling into our new place and I am really enjoying our new kitchen! I think it will be a lot of fun to develop new foods over time. A few months ago I prepared a brunch for SensitiveHusband and me. The brunch took place awhile ago, as you can probably tell from the winter-themed plates we used! However, the menu will work well during any season. In fact, this meal has become a ‘regular’ in our house because we always have these ingredients on hand and the meal can be made within 30 minutes. The main star is a Spinach and Sausage Frittata, which has the texture of a fluffy omelette. I was inspired by a frittata recipe that I found online through MyRecipes. I decided to use fresh spinach rather than frozen, I reduced the amount of cheese and egg just a bit, and I found a wonderful sausage that is free of sugar, yeast, and onions while still full of flavor. Did I mention that the sausages are gluten free too? And they are fully cooked? Can you tell I like them? 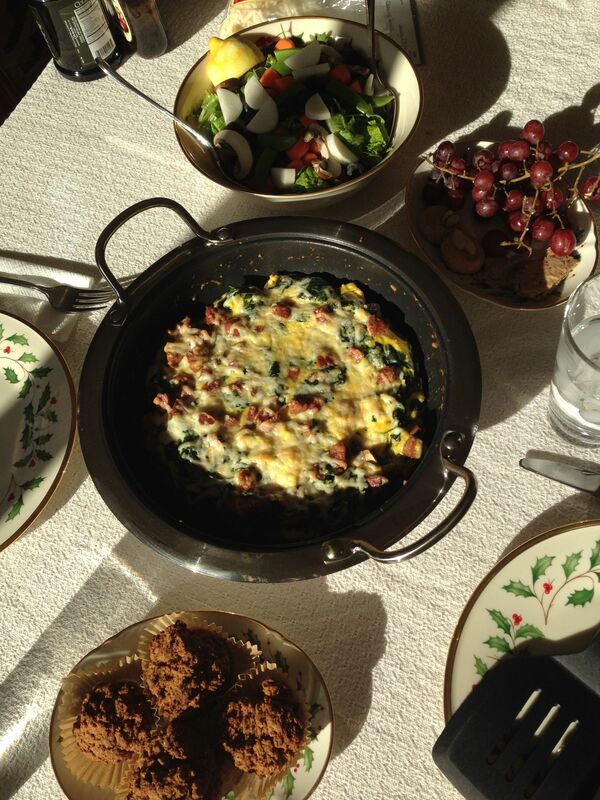 I served the frittata with some pumpkin muffins, a simple salad, and a bunch of grapes. We really enjoyed this meal! I hope you do too. Preheat oven to 400°F. In a large nonstick, ovenproof skillet, warm olive oil over medium-high heat. (If skillet isn’t ovenproof, wrap handles in a double layer of foil.) Chop sausage into bite-sized pieces and add to skillet. Brown the sausages on all sides, about 7-10 minutes (or if using uncooked sausages, cook thoroughly). Squeeze as much liquid as possible from spinach, then add to skillet. Cook, stirring well and scraping up any cooked bits on bottom of skillet. Pour eggs into skillet and stir to mix with spinach/sausage mixture. Stop stirring and cook over medium heat, lifting edges of frittata with a spatula to let uncooked eggs flow underneath. Cook until almost set, about 3 minutes. Sprinkle cheese on top and transfer skillet to oven. Bake, uncovered, until frittata is puffed and lightly browned on top, about 10-12 minutes. Lift frittata around edges of skillet and gently shake pan to loosen. Slide out of pan and onto a cutting board and cut into wedges. Serve hot or at room temperature. Makes 4-6 servings. 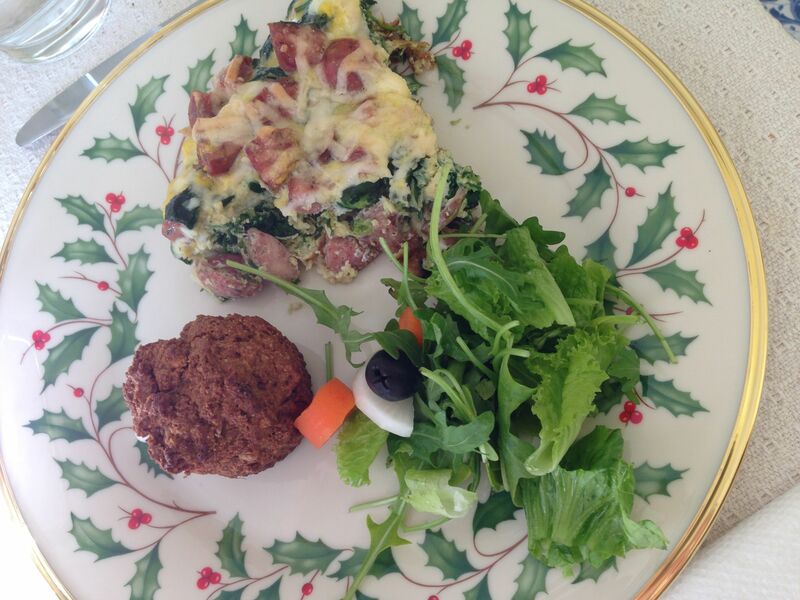 This entry was posted in Recipes - Breakfast, Recipes - Entrees and tagged Cane sugar free, frittata, Gluten free, Sausage, Spinach, Yeast free. Bookmark the permalink.